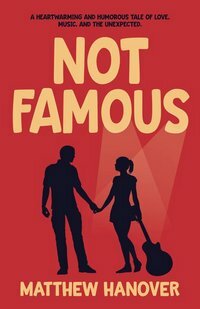 Pub Day Repost: Not Famous by Matthew Hanover: A Sweet bit of Lad Lit that’ll fill your Heart with Song. This is now available for pre-order at a discounted price! Take advantage of it while you can! We meet Nick a couple of months after one of the most embarrassing experiences of his life — a marriage proposal that goes awry. He’s still reeling from that when he meets a very cute, and comparatively young, barista at his favorite Seattle-based Coffee chain shop. Alli’s not just a barista, she’s also a musician — a solo act, just a girl with a guitar — so Nick goes to one of her shows. He falls in love with her music right away, and somehow convinces her to go to dinner with him. Which is just the beginning of their story. Alli’s a very private person with no romantic past. At all. Which seems hard to believe when you read it here, but when she tells Nick that, you have no problem believing it. Unless she’s singing, she seems nervous, uncertain, and shy. But on stage . . . she’s a different person. And while she seems like a shrinking violet, she has a will of iron when it counts. One of the places it counts surrounds her past — it’s a closed book — and it doesn’t seem likely that she’ll open up until and unless she truly trusts someone. Although she’s put up enough walls to protect herself that it’s going to take quite the guy to get her to let her defenses down. Now, on the other hand, Nick has some kind of romantic past, but it’s hard to believe it sometimes as he fumbles his way through this relationship. It’s kind of fun to watch him act like he’s an expert on romance, someone guiding Alli through this new territory for her, and then frequently doing and saying the wrong things — almost sabotaging the relationship more times than he’d care to admit. Some of this comes from general ineptitude, some comes from the damage done to him in his last relationship (much of which he doesn’t realize happened). Now, I don’t want to take any thing away from Nick or Alli — they’re they heart and soul of the novel. But, I want to talk a little bit about Nick’s sister, Lacy. Her father was their mom’s second husband, and about ten years younger. They’re not close, but their mother keeps trying to get Nick to be involved — after his step-father died, Nick’s really the only male influence in her life. Lacy, like their mom, wants them to be close. She sees him as her big brother, even if he only sees her as his much younger step-sister. As the book goes on, Nick’s maturity can be gauged by his relationship to his little sister. Naturally, like just about everything that’s not work in his life, Alli’s influence and action improves things — the friendship between Lacy and Alli forces Nick to play a larger role in his sister’s life. And before long, he doesn’t need Alli’s efforts to want that closeness himself. I thoroughly enjoyed Lacy as a character, and watching how Nick changes in relation to her — she was the added something that made this book more than just a sweet love story. She’s not around much, actually, and there are characters that have a more obvious impact on the plot — but she’s the non-Nick/Alli character that sticks with you. She’s also the one character whose main role isn’t to serve the Nick/Alli relationship in some way. Now, she does serve that — don’t get me wrong. But that’s not the chief purpose for her. I have nothing against Alli’s Starbucks coworkers, or fellow musicians who only show up to encourage the romance. Or Nick’s roommate, or friend/partner who give him reality checks and the prodding her needs. But they really don’t do much else. But little sister does. If I ever get to interview Hanover, we’re going to spend a lot of time talking about her. I would have appreciated having a better sense of who Nick is outside the relationship. I do have a sense of him as a single guy, as a friend, as a professional — but I’d have liked a bit more of that. It’s really hard to have much of a read on Alli outside their romance, as it’s all told from Nick’s POV. But you do get hints — I’d have liked a few more. But since this is the story of Nick and Alli, it’s appropriate (and enough) that we get a really strong idea about them as individuals relating to each other and them as a couple, and how that dynamic functions. I’m just a reader who almost always wants a little more than an author gives me. At the end of the day — and long before that, actually — what you think about this book boils down to one thing: Alli. Do you like her as a character — do you fall under the same spell that Nick does? (or can you see why someone would?) Moreover, her secret — do you care? And is that caring based on this struggling artist trying to make her way in the world, or do you care because you’re curious? Nick, his struggles, his ineptitude, Lacey, etc. — you’re appreciation of the book will be flavored by your appreciation of those, but it’s all about Alli when it comes to the question of, “Do you like this book?” And Nick, at least, would have it no other way. Not Famous is almost as much a tribute to Nick Hornby as it is a story in the same vein as his work. There are nods to Jonathan Tropper and Matthew Norman, too — probably Mike Gayle as well, but it’s been so long since I’ve read him, it’s hard for me to recognize that. This is not a bad thing — in fact, I quite appreciate it, and enjoyed the process of seeing how Hanover reflects his influences in his writing. At some point, I can’t tell you where, I stopped thinking about Not Famous as something that I was going to post about, or something I was going to provide feedback on. I just got wrapped up in the story and the fate of these two characters (and his sister, actually). I stopped thinking about how Hanover wrote and was only concerned with what he wrote (not that I didn’t notice the former, I just didn’t care). It’s always a good sign when I disengage the critical part of my brain and simply read. Not Famous — it’s cute, it’s amusing, it’s charming, it’s sweet. It’s the kind of book that you want to bring home to mother (okay, that line’s borderline cheesy, I know — but my mom would really enjoy this book) — and even bring it home to your daughter. I hope this book is successful enough to warrant future novels from Hanover, because I would love to read more. Disclaimer: I was given a copy of this ARC by the author in exchange for this post. Which gave me something to opine about, but otherwise didn’t influence my opinion.